UNITED NATIONS, May 22, updated and voluntarily redacted on May 25 -- Despite the UN being a public institution, and despite Ban Ki-moon having run for Secretary-General on a platform of transparency, his Spokesperson on May 22 for the third time in five days denied access to a list of UN staff sorted by nationality. On May 17, an Associate Spokesperson who came along with Mr. Ban's transition team declined to provide even the name of another new hire from the transition team but now in the UN Department of Management (DM). In the face of this stonewalling, Inner City Press has put in a formal freedom of information-type request to the chief of the DM. Inner City Press has also, without the assistance of the UN Department of Public Information, reviewed a copy of the presumptively public data in the List of Staff of the UN Secretariat, and sets forth below, including as a sample to review Mr. Ban's "managed mobility" plan, a list of the 51 South Korean UN staffers in mid-2006. It should be noted that while the Spokesperson began, on May 17, by saying the List is only for member states, "and you are not a member state," the Swiss Ambassador, for example, has been clear that the List should not be kept secret. Going forward, in the spirit of transparency, this list should be periodically updated, beginning now, specifically with the name of the still-unnamed person brought into the UN along with Mr. Ban's transition team and placed in the Department of Management. Team Ban refuse to provide the name; in five days, the only argument advanced is that since the person is not technically on the 38th floor, unlike the other three the name need not be provided. This argument is inconsistent with the platform Mr. Ban ran on. Practically speaking, given Team Ban's (non) response, it appears that the only way to proceed is by comparing the list below, from mid-2006, to current, real-time information and identifying the new staff members. Consultants, as noted, are in their own gray zone. Mr. Ban is nearly entirely free to hire nearly whomever he wants. But to decline to provide names of senior appointments and people brought in with the transition team, and to withhold in full this basic information, militates for an ongoing investigative project. Mr. Ban's Spokesperson on May 17 chided Inner City Press for being interested in names, when "other correspondents here are interested in burning political questions." Inner City Press does cover political questions -- but generally directs its questions in this regard to members of the UN Security Council, which acts on questions of international peace and security. 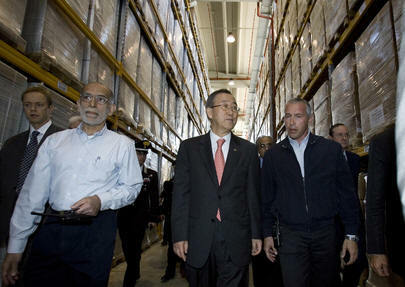 Mr. Ban ran on a platform of managing the UN better, and not speechifying as much as his predecessor. Half a year in, there are daily statements about far away issues, many of which the UN Secretariat has very little influence over. On political items directly in his control, such as whether to expand the use of peacekeepers from Fiji despite December's military coup, a question has gone unresponded-to for two days. And basic management information is being withheld. Despite attempts to dissuade, including by holding reporting on UN management and reform to a higher standard than other UN reporting, Inner City Press intends to continue to pursue the Ban management story. The publication today of this baseline list is part of that coverage, but only part. This series will continue. As a preliminary analysis of the List, the South Korean staffers at the UN in 2006 appear clustered, for example in the Economic and Social Commission for Asia and the Pacific, ESCAP, which is headed by a South Korean, Kim Hak-su. In the following list, the names in bold are new, and did not appear in the 2005 List. There is a separate list of those who appeared in 2005 but not 2006. While the Spokesperson has not said which of the information is the basis of the withholding, Inner City Press is for now redacting the column on "contractual status," including not only "dollar a year" but also whether "subject to the system of desirable ranges," even though there is no reason such information is private in a public institution. Whether a staff member is P-3 or P-4, etc., cannot be confidential: for example, Mr. Ban has advised journalists not to take their impression of the UN from "P-3s." While Inner City Press disagrees, how does Team Ban expect even compliant journalists to try to follow instructions if P-3 status is withheld? We will be reporting further on this and other lists. In connection with the provision of these names, Ms. Choi Soung-ah came into the Spokesperson's office. Ms. Choi stated that five people, herself included, had come over with the transition, and she named journalists who she said knew all five. Who then is the fifth, Inner City Press asked. A person in the Department of Management, Ms. Choi said, and declined to provide the name, stating that he has nothing to do with the Executive Office. Staff tell Inner City Press he is working on "mandate review," although the OSSG has refused to name the individual or provide other information. One might infer from this series that withholding information and trying to dissuade inquiry and reporting may not attain the objective that is intended. Question: Just briefly, this public document, the copy from the Secretariat that you referred me to, it seems to not include consultants or dollar-a-year or when-actually-employed people. They're not included in the count. Spokesperson: Which count? What document are you referring to? Question: The public composition of the Secretariat document doesn't include in the count consultants, and explicitly excludes dollar-a-year officials and when-actually-employed people. So I was wondering, first of all, if there's some reason why they're excluded but also, how many consultants the Secretariat or Secretary-General has? Spokesperson: If they're dollar-a-year people, they would not be included here. We're talking about people who are employed on a regular basis with the Secretariat. Question: Well, I guess with consultants, that's where it seems... It seems that somebody who's a consultant can be working for the UN virtually full time but they're not going to show up in these places. It's just a factual question. I wanted to know how many consultants there are. Spokesperson: I can check for you but you can always check for yourself. Question: That's what I�m saying. The public document doesn't have that information. That�s why I can't check. Spokesperson: Okay, we'll check on that. But you know, we've spent a lot of time on that list. Correspondent: If it were released, we wouldn't be spending any time on it. Spokesperson: It's not going to be made a public document. If you want to consult it and you need permission to consult it, we'll give you the necessary information. Question: Ms. [Alicia] Barcena said there's a movement afoot to put in a freedom of information policy at the United Nations. Even in the absence of such a policy, is there a place where one can make a formal request that a document that seems like it contains all public information be released? I don't want to keep doing it here. I agree with you. So to whom is such a request made? Correspondent: And I think it should be made public. Spokesperson: That's your opinion. And it's for reasons of privacy, as I said, that it's not public... it does not circulate publicly, it is for background information only. Okay? Thank you very much. The statement that the List does not include a code for dollar-a-year and When Actually Employed is not the case. In an attempt to obtain an answer to the questions asked, including how many consultants are employed, and to whom in the UN Secretariat to make a formal request that this List be released to the public, Inner City Press reiterated both in writing to the Office of the Spokesperson early Tuesday afternoon. Despite deadline, no response at all was received by 11 p.m. on Tuesday. When a public institution like the UN provides no mechanism to challenge the arbitrary withholding of presumptively public information, it appears that the only way to proceed is by moving forward with what information is available. Provided to date: no information about consultants, not even to whom to make a request. A request has nonetheless been sent, in the style of a freedom of information request. Developing. The five staff members from the Republic of Korea ,who were appointed by the Secretary-General, were appointed to the Executive Office of the Secretary-General (EOSG). Two of them, Choi Soung-ah and Kweon Ki-hwan, have been assigned to other departments -- the Department of Public Information and the Department of Management respectively. But they remain staff members of EOSG, and perform tasks that are closely related to EOSG work. While we recognize your right to report, the publication and singling out of UN staffers simply because of the passport they carry is unfair to these international civil servants. It is especially unfair to have targeted nationals of the Republic of Korea who were in the organization before Ban Ki-moon became Secretary-General. This "once more" reference is to a briefing given to dozens of UN correspondents by a person who insisted on only being identified as "a senior UN official," and who proceeded to repeatedly state that a white plane used by the Sudanese government in Darfur, with "UN" on its wing, came from Kazakhstan. Later, Inner City Press' research, still not contested by the UN, matched the number on the plane's wing with a Russian airline, and after deliberation, Inner City Press did not name the UN briefer, but stated his nationality, Russian. Inner City Press was approached by an individual in the UN Department of Public Information -- apparently no one in the UN is supposed to be named -- and had what seemed to be a clarifying conversation. Among other things, Inner City Press advised that particularly in light of the UN's position that as an inter-governmental body they must defer to member states (most recently canceling a human rights film about the Hmong at the request of Vietnam, click here for that), the UN should not be requesting anonymity in order to accuse, as it now appears falsely, a member state. The conversation seemed productive. Now Ms. Montas bootstraps on the "white plane" situation to claim that Inner City Press' use of the List of Staff of the UN Secretariat, which Inner City Press did not access in Ms. Montas' office in light of her demand that this only be on "background" and could not be used. Inner City Press was provided with the information by a source, without any restriction, just as the Sudan white plane story originated by a leak of a then-confidential UN report to a UN correspondent. Ms. Montas and DPI did not ask that the white plane information not be published, or be retracted. But now the claim is that since the UN made an offer of the List on background -- an offer that was rejected -- the UN can now state that it is disappointed that information that it characterizes as background was published. Inner City Press -- and the Swiss mission to the UN, as previously reported -- dispute that the List should be withheld, and Inner City Press obtained it from another source, and even then redacted a portion of it, contract status. It is worth noting, as simply one example, that the U.S. State Department phone book of names and posts is on its Web site. In fact, public UN information lists names, and the definition (by "grade") of posts. So apparently the claim is that nationality is confidential, even though the UN has a hiring system (called "desirable ranges") that is explicitly based on nationality. To accommodate this request, however, Inner City Press today redacts from its May 22 article the names of the 51 South Koreans employed in the UN Secretariat in mid-2006, pre-Ban. Inner City Press has asked that this number be updated; there has been no response yet to that request. To be clear, the number at December 31, 2006 may have been higher than 51. Inner City Press is told by well placed sources that the Department of Economic and Social Affairs, DESA, noticeably started hiring South Koreans after Mr. Ban's selection as S-G, but before the end of the year. Questions that should in the interim be answered: what was the number on December 31, 2006; what is the number now, and when and how frequently will updates be provided? And as to the claim at Friday's noon briefing that there was an interview and evaluation process for the post, the vacancy announcements should be produced. A statement made at Friday's noon briefing was that "all posts on the 38th floor were staffed through a competitive process." Video here, from Minute 12:35.This has elicited laughter from several of Inner City Press' sources, distilled to a question: was there a competitive process for the posts of Messrs. Kim, Lee and Yoon? But we'll assume that the "all" was mis-spoken. And we'll hope for -- and invest time in -- a better question-and-answer process next week.